This photo shows Major Horatio Herbert Kitchener of the Royal Engineers, recognisable from the image of him years later as a Field Marshal in the famous First World War recruitment poster. Here we see him fresh from the Nile campaign of 1884-5, on the cusp of a career that would see his meteoric rise to Sirdar of the Egyptian Army, Commander-in-Chief in India and finally Secretary of State for War in 1914. The popular perception of Kitchener is built on that recruitment poster, which has become associated with the castigation of British leadership in the First World War. 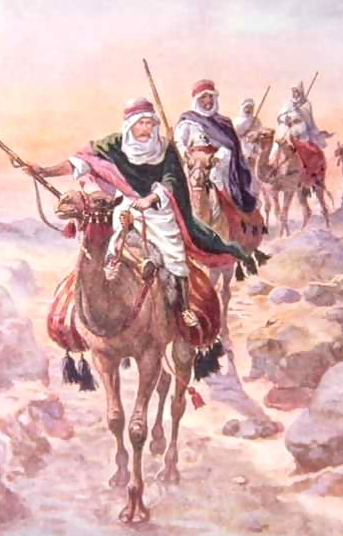 But in researching my novel Pharaoh, which is set partly around the Nile expedition and the attempt to rescue General Gordon from the Mahdist siege at Khartoum, I found myself confronting a character almost wholly at odds with that image, one which left me rather awestruck. 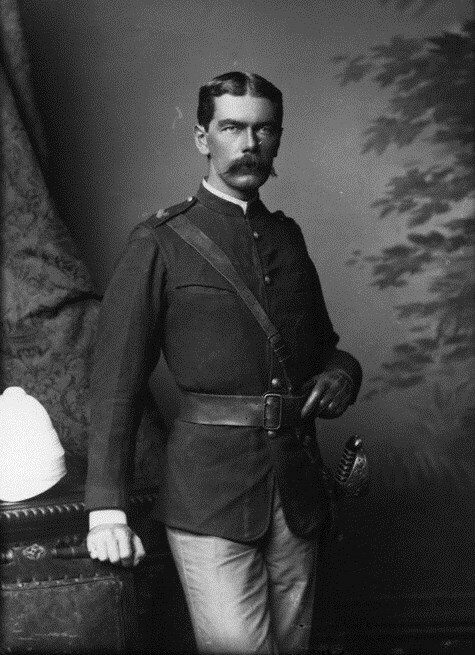 Kitchener joined General Wolseley’s expedition on the Nile as ‘Deputy Assistant Adjutant-General for Intelligence’, with the brief to organise intelligence-gathering ahead of the expedition as it advanced. He was a good choice: he was fresh from several years in Palestine, was a fluent Arabic-speaker and was utterly at home among the tribesmen. He was tireless, burningly ambitious, single-minded in his determination, passionate about his interests, solitary but caring of his friends, and with the shyness that lay behind the aloofness of later years but was not yet so effectively concealed, making him seem brash and rude to some. He was a towering physical presence, already using the famous cast in his left eye to good effect, staring down any opposition. He was opinionated, outspoken and supremely self-confident, insubordinate and an individualist, a thirty-four year old major already acting like a general, infuriating the less imaginative of his superiors but tolerated by those like Wolseley who could see his future. But the image that really transfixed me was of a man who also loved adventure and danger, who relished the edginess and proximity to death of desert life. He was given pretty free rein by Wolseley, or rather gave it to himself, and soon was in command of the fifteen-hundred strong ’Ababda Frontier Force, in effect his private army. Twenty cutthroat warriors were sworn to defend him to the death, evidence of the extreme loyalty that a man like Kitchener could inspire, and he rode in disguise with them deep into the desert. There are no photographs of him in this guise, but the image from the descriptions is not far from those famous photos of SAS soldiers in the desert during the Second World War, bearded and bronzed, hard as nails, most of them mavericks like Kitchener, only sitting in trucks rather than on camels. It was a jolt for me to realise that had Kitchener been of that age in the Second World War that’s what he would be been most at home doing, or in the First World War leading an irregular force in the desert like the Arab army of T.E. Lawrence. Kitchener made his way in disguise to Khartoum and was possibly the last European to see Gordon alive. Hugely frustrated by the failure to rescue him, Kitchener swore revenge and exacted it thirteen years later at Omdurman, destroying the dervish army and desecrating the Mahdi’s tomb. Seeing that photo of the young Kitchener is therefore not just about understanding the man, but also about highlighting what I would argue was his greatest impact on history – not in India as Commander-in-Chief or even as Secretary-of-State during the First World War, but rather on that day in 1885 when the terrible news was confirmed and he swore to take a life for ‘every hair on Gordon’s head.’ The tribal chieftains in the Madhi army who were his enemies would have understood and respected his oath – he was a fellow desert warrior, and spoke their language – but in so doing he was foreshadowing their own call for retribution after Omdurman, a factor in the rise of fundamentalism and of huge relevance to the world today. I have a small personal connection: my grandfather remembered being ‘dandled’ on Lord Kitchener’s knee as a child; his grandfather had been a fellow Royal Engineer and friend of Kitchener’s from early days. Even that anecdote adds something to the larger-than-life figure we see leading Britain to war at that time, in the years prior to his death at sea in 1915. And none of this should overshadow the other extraordinary image of Kitchener in his early career, as a young subaltern leading a Royal Engineers survey party the length and breadth of Palestine, not only carrying out mapping work but also exhaustively recording all of the ancient sites and monuments he saw. The resulting publication marks Kitchener out in my mind as one of the pioneer archaeologists of the 19th century. He was by no means the only officer on the Nile in 1884 fascinated by the ancient history and archaeology of the Holy Land, not least General Gordon himself, and finding out about the remarkable breath of their interests in antiquity formed another important backdrop to my novel.